We have seen a lot of techy gadgets designed to help people save water, but they often feature obtrusive readouts or require outfitting your home with clunky fixtures. That’s why we love that the Waterpebble’s simplicity and its unique way of teaching users to save water. The device measures how much water you use and glows a series of colors to let you know when to turn off the faucet. Blending right in with your soap bubbles, the Waterpebble sits at the bottom of the shower and measures the amount of water that passes by. On the first use, the Waterpebble takes note of how much water is used and stores the information. 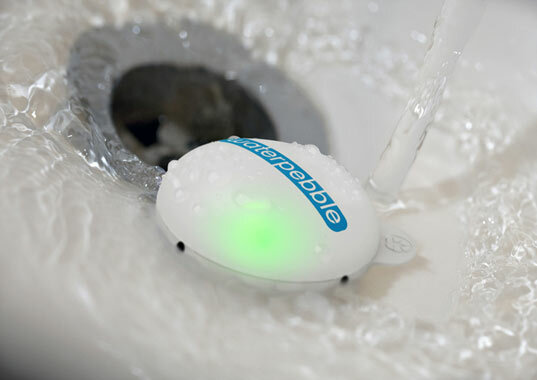 The next time you get in to wash your locks, the Waterpebble glows a series of colors to let you know how much water you are using in comparison to your previous shower. It starts out green, but then turns yellow to warn when you have used half as much water as the previous bathing. When it begins to flash red, you know that you must finish up quickly so as to not go over your previous usage. The goal is simply to finish before you see the red light, so that your new, faster shower time is recorded. Withing being pushy, the pebble automatically reduces your time each time you shower. The Waterpebble website states that the product is fully recyclable (although we question how the LED light would be considered recyclable). For helping you lessen the impact of your morning regimen, this little widget seems like a wise investment, at a cost of only £8GPB ($12USD). I like it but i feel they can add that to the shower head. It can change the water into different colors using led lights. That way you cant lie to yourself saying you didn't see it and make your showers interesting. We have seen a lot of techy gadgets designed to help people save water, but they often feature obtrusive readouts or require outfitting your home with clunky fixtures. That's why we love that the Waterpebble’s simplicity and its unique way of teaching users to save water. The device measures how much water you use and glows a series of colors to let you know when to turn off the faucet.